Building a 3D model of Disney’s The Haunted Mansion. Disney’s Haunted Mansion ride is a big fan favorite with a lot of websites devoted to it out there. 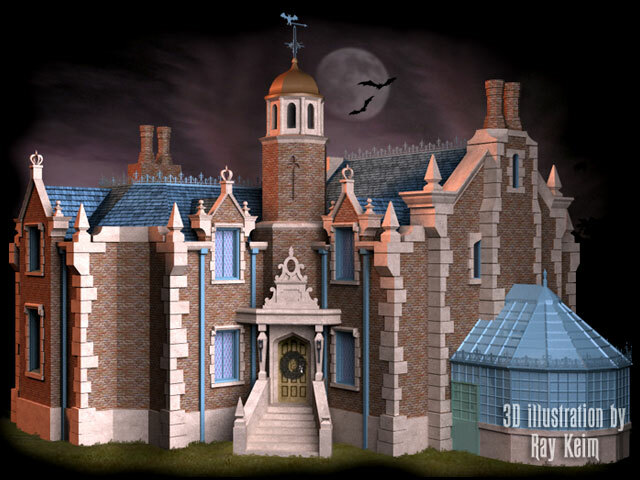 Included among them is Ray Keim’s Haunted Dimensions site devoted to how he created a 3D model of the Orlando mansion for no reason other than he felt the need to do so. The problem with that is the fact that the blueprints for the facade—the actual ride is underground and the mansion itself is hollow—are a closely guarded secret of the Disney corporation. So Ray had to sit down with little more than a collection of photographs of the mansion and figure out how big or small things should be with only those visual references to work from. Because the Orlando Haunted Mansion is on a hill, and at some distance from the guests, most photos show the Haunted Mansion at extreme angles and severe perspectives. In order to create undistorted mechanical drawing of the walls, I had to find photos that had as little distortion as possible. I found a great shot of the east facade and conservatory, which was shot from a nearly head-on view. I brought the photo into Adobe Photoshop, marked off vertical and horizontal guides (based on the corners and roof lines). Using the “Transform > Distort” tool, I was able to pull and stretch the image, until the edges lined up squarely. I could then use the image as a template, to redraw the facade as clean, solid shapes, to be imported in to Lightwave as background templates for modeling. The squared-up, east facade could then be used as a point of reference for the creation of the rest of the mansion’s outer walls. Each wall image was imported in to Lightwave, where I could build them in a 3D space. Once the walls were created, I could arrange them based on a few very low resolution aerial shots of Liberty Square. But they were enough to get an understanding of the Haunted Mansion layout, which is almost impossible to figure out from the ground. Here is what I finally came up with. He’s done an amazing job considering what he had to work with. The final 3D model is easily recognizable to anyone who has ever seen the real thing. His site also contains some of the other Haunted Mansion projects he’s undertaken which are worth checking out as well. This entry was posted in Neato and tagged Neato by Les. Bookmark the permalink.